Instability refers to dangerous, destructive, or unpleasant features in an age. Instability can be caused by conflicts in an age's description or by an overabundance of rare resources—intentional or not. In Myst lore, the Art of writing ages was primarily focused on avoiding contradictions that would cause instability. Mystcraft builds on that by also making it a balance mechanic. Instability comes in several degrees of severity. The weakest form a world that is vaguely inhospitable to outsiders. These are worlds that inflict potion-style debuffs on you, or that give mobs in the world a benefit/positive buff. The weakest form of these only affect you when you are "outdoors" (exposed to the sky); stronger forms affect you when you are inside/underground. The middle severity form worlds that are generally dangerous. Worlds that are so close to the sun that you (and mobs in the world) take damage from the environment. Etc. The final severity are worlds that will be destroyed given enough time. This can range from meteors, to decay blocks, to runaway erosion. Internally, instability can be generated (or reduced) based on factors of writing. Some symbols, such as "lacking medium features", directly add; others, typically that duplicate an instability affect, directly reduce. Explicitly writing inconsistencies will add, as will using "clear modifiers" to remove dangling modifiers. Other factors include mod behavior (other mods can add or subtract instability) and general luck/variation as the world is explored (approximately every 100 chunks the instability level is recalculated based on what blocks the world contains). Each type of instability can be individually disabled in the config file; if the nausea effect (for example) is a problem, one can disable only that and leave the others. On a server, the server must disable the unwanted effects. Because instability levels can change over time, the current version of Mystcraft does not put block-based instability into the chunks at world gen, but alters the chunk during play. Internally, there are 5 categories of instability levels. However, there is overlap at different levels of probability. World destruction is only found in the last 2 categories, for example, but different forms of world destruction are found at different probabilities in those 2 categories. Harmful environment can be found in the last 3 categories. Potion effects are found in at least the first 3 categories, can happen multiple times (will stack to a stronger potion effect level), and in later categories will affect you when you are not exposed to the sky (global/affecting the underground as well). These are managed internally using card deck mechanics. Instability can manifest as status effects on players and other mobs when inside an Age. Depending on how unstable the Age is, some effects may only show up on the surface of the Age, or they may be present regardless of location. Status effects may appear at any level of instability, Ages with only surface status effects can still be quite livable. † Applied to all mobs except players. Surface effects will apply when standing on any block exposed to the sky. Transparent blocks such as Glass do not prevent exposure. However, blocks such as leaf blocks will. Some blocks from other mods may be transparent despite appearing solid, meaning they will not prevent exposure to surface level effects. Explosions are created randomly. These explosions can light blocks on fire, deal damage to the player and knock the player off the world if it is a Void, End, or Skylands world, but they are generally incapable of destroying blocks such as Stone. Left unchecked, these will ultimately result in the destruction of everything in the Age. Example of the craters left by meteors. Meteors will fall randomly from the sky and destroy large sections of the world. Meteors can destroy the entire world if given enough time. Meteors may leave some ores around the crater. Several types of Colored Decay exist. N.b. : these blocks can be picked up in creative mode. They can only be placed down in ages. Even if placed, they will not spread unless that age qualifies for them. In particular, they can be used to decorate creative builds in most ages. Unique feature: Causes ground to collapse. It only Verify spreads to existing blocks, and it spreads faster up and down than it does to the sidesVerify (( this seems really wrong; in 1.4.7 my memory is that it would only spread down and sideways, not up, and would spread faster sideways. I have not seen black decay in modern Mystcraft )). It also has the unique trait when two blocks form on top of each other, they will merge into one block of decay and cause every block above it to fall, even blocks that are normally unaffected by gravity. It can be blown up with TNT. Black decay will spread through bedrock. If it reaches the bottom of the world, then the entire column of blocks above it will fall out of the world. Black decay collapsing will stop at air blocks; because of the presence of caves, or even a manually placed/carved airgap, black decay will leave scattered islands, at least temporarily. Because new decay blocks will be placed over time, eventually those platforms will go as well. When a column collapses, the 4 neighboring columns can have air gaps collapse if the collapsing column goes up to the top of the air. 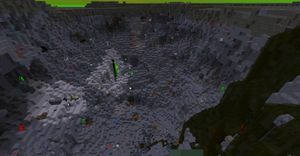 Any water on top of a collapsing column is deleted (replaced with air) Verify the effect on other liquids such as lava. Time to break with diamond pick: 1 second. Unique feature: Spreads based on mining hardness. Blue decay travels through blocks at a speed based on the mining hardness; blocks that are easier to mine will spread faster. It will not spread through bedrock. It can be blown up with TNT. Time to break with diamond shovel: 1/2 second. Unique feature: Spreads based on TNT resistance. Red decay travels through blocks at a speed based on the explosion resistance; blocks that are easier to blow up with TNT will spread faster. It will not spread through bedrock. Time to break with diamond pick: 9.5 seconds. Unique feature: Spreads through liquids, other decay blocks, and air. It spreads rapidly through liquids, a little slower through other decay blocks, slower yet through air (but faster than red or blue spread through air), and very slow through ground blocks. Purple decay will not spread through bedrock. Unique feature: Can damage player. White decay after 20 minutes of instability, beginning to grow over meteor craters. White Decay acts like the other colored decays, but eats through everything much quicker. It will eat through other decay blocks (tested in 1.4.7; even a black decay heavy world was calmed down. Verify for current Mystcraft), and slowly grows into the air. It is also the only decay that can physically harm the player. It deals an armor-penetrating half-heart of damage per second, but only if the player is moving. It can NOT be blown up with TNT. 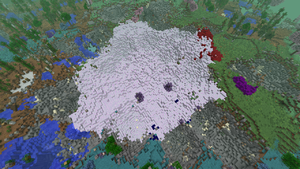 Normal spawning for the red, blue, and purple decay blocks is between Y=25 and the highest worldgen block (includes any Mystcraft generation, such as tendrills or floating islands); for white, it is Y=20 and above. These blocks will spawn in air; a tendril or floating island in the sky will result in decay blocks in the atmosphere. An erosion effect; will cause blocks to break down. Diamond ore will turn into coal ore. Smooth stone will turn into cobblestone. Gravel will turn into sand. Logs into planks. Etc. Given enough time, this will result in a world that is entirely sand. In the most extreme form, bedrock will also erode, and the outcome will be a void world. Instability configuration can be found in your .minecraft folder, inside config/mystcraft/instabilities.cfg. Each instability effect can be disabled as desired by changing true to false. Lines containing a Status Effect followed by ,g (such as B:"hunger,g.enabled"=true) refer to the global version of that effect. All other lines containing a status effect refer to the surface-level version of that effect. A shortcut to disable all instability is to set the global.enabled flag to false in the instability section of config/mystcraft/balance.cfg. When starting a new world with Mystcraft installed, a profiling process will begin in the background. This process is used to determine the rarity of the various blocks and liquids in the game. If an Age contains a significant amount of rare materials, instability will be added to compensate for balance. If profiling degrades performance significantly and waiting for it to complete is not an option, it can be disabled in the configuration. See the comments in the baselining section of config/mystcraft/core.cfg for more details. Advanced users can provide their own values for each block instead of profiling, by filling out config/mystcraft/balance.cfg and fully disabling profiling. It is possible to try to determine why an age is unstable using the Mystcraft debug command (/myst-dbg). This command will automatically complete entries when you press tab, and will cycle to the next possible option on another tab press. In order to read the current instability score values in an age, the read instruction should be used. Here we want to read from ages, followed by specifying the target age (currently loaded ages are available). The instability values are under instability, and split into multiple sections. The total gives the absolute instability score of the age. This page was last modified on 6 July 2018, at 13:26.